The other night we looked up and saw an unusually large and slow satellite moving across the sky. Could it have been the space station? I found NASA’s Spot the Station page and looked up our location. Sure enough, there was a space station transit on that night, at that time, in that place in the sky. Naturally I wondered if I could get that schedule of sightings onto my calendar. 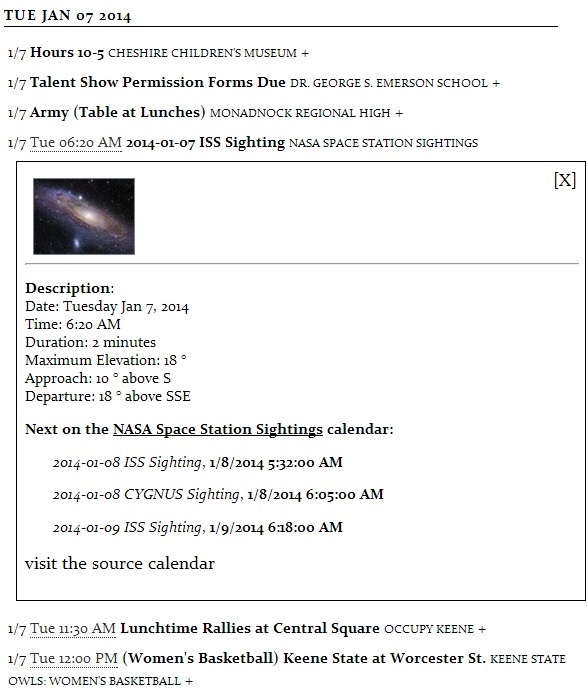 But sadly, as is so often the case, there is an RSS feed for upcoming sightings but no iCalendar feed. I wish more online services would realize that when your feed is purely a schedule of upcoming events, it’s really useful to render it in iCalendar format as well as RSS. Conversion from RSS to iCalendar is often possible, but it’s rarely trivial, and nobody is going to bother. If anyone reading this has the right connections, please do invite NASA to publish iCalendar feeds natively alongside the RSS feeds they currently provide. Author Jon UdellPosted on 3 Jan 2014 3 Jan 2014 Categories .